F.N. 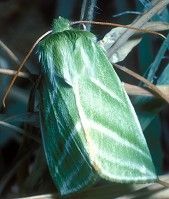 Pierce's volume covering the male Noctuidae was published in 1909; Pierce later realised that the female genitalia were also of value in identification, so the volume covering the female Noctuidae followed in 1942. Though they are regarded as invaluable for identifying difficult species, the originals are not easily available, and the reprinted versions were considered inferior in quality. Pisces Conservation are delighted to have worked with the Lancashire and Cheshire Entomological Society to produce these volumes in electronic form. We have very carefully scanned and cleaned the original artwork to recreate the plates from scratch. Furthermore, we have added species concordance (kindly provided by Dr. Mike Hull) for all the species and their synonyms, with Bradley and Karsholt numbers, to assist the modern lepidopterist. The male and female volumes of the "Genitalia of the Noctuidae" are available together on one CD, for Windows PCs and Macs, with fully searchable text and hyperlinks for ease of navigation. The quality of reproduction of illustrations and text is excellent. With the addition of modern concordance, as well as high-quality images and the advantages the PDF format allows, we have produced more than a facsimile copy, a genuine improvement which will bring the original work to life for the modern user.